Our Boston Coffee Lab is officially open at G-TEK Labs, a co-working space located at 28 Damrell St. in South Boston. 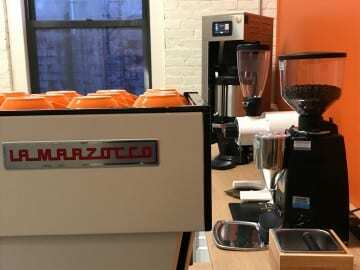 We designed the Lab specifically for the purpose of training and educating our Boston coffee partners in a state of the art cafe environment. We encourage you to setup a class for you and your staff. And we look forward to having you join us soon! Barista Training – Addressing water conditioning, espresso machine and grinder operation and breakdown, shot preparation, milk texturing, equipment cleaning and maintenance. Origin Cupping – A customized workshop designed to help develop organoleptic profiling. Coffee Fundamentals – Addressing the history of coffee, phylogeny, territory, processing, roasting, and organoleptic profiling. To schedule, please email Erin Miller, Wholesale Director.